Pim Balkestein moved abroad in summer 2008. He is a product of the Heerenveen youth academy but never made his début for the Frisian club. Balkestein has signed a two year deal at Portman Road until 2010 with an option on a third. To keep up his match fitness, Balkestein was send on two short loan periods at Brentford in the middle of the 2009-10 season. On August 6 2010, Brentford manager Andy Scott sealed his deal on permanent basis, a contract until June 2013. In August 2011 he went on a new loan period. Rochdale signed the young defender on a deal until January 2012. 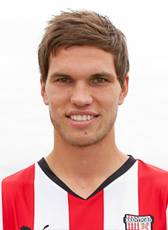 His loan period was not as was expected and he returned to Brentford in January 2012. At the end of the 2011-12 season, he was released from his contract. Head coach Rosler saw no future for the defender and was allowed a free transfer. Balkestein moved to AFC Wimbledon for the 2012-13 season with an option for another season. The option was not lifted and Balkestein returned home. He signed a 1-year contract at just relegated VVV Venlo until June 2014. The defender is currently under contract until June 2016. In August 2015 it was announced that Balkestein moved from VVV Venlo to German club SV Elversberg. SV Elversberg is competing at Regionalliga Südwest, the fourth level in German (semi-)professional football. After just five appearances, his contract was terminated in winter 2016. In January 2016 he returned home signing for the Topklasse club (third tier) of de Treffers Groesbeek.